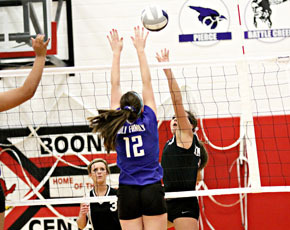 In a virtual repeat of the Mid-State Conference tournament one week ago, the Boone Central volleyball team closed its 2011 season Monday in the C1-9 Sub-District at Norfolk. As in conference play, Boone Central opened the C1-9 event with a victory over Madison (25-14, 22-25, 25-16, 25-10), then lost to top-seeded Norfolk Catholic (19-25, 13-25, 16-25). Several Albion News area volleyball teams enjoyed success and advancd in post-season play Monday night, while others saw their 2011 seasons come to and end in sub-district tournaments. 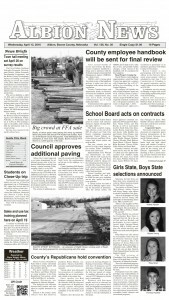 Spalding/Spalding Academy was runner-up in the D2-4 Sub-District in Albion Monday night. The Lady Knights opened with a 25-19, 25-23, 25-22 victory over area rival Lindsay Holy Family, then dropped a 22-25, 25-22, 22-25, 20-25 decision to Elkhorn Valley. Elkhorn Valley defeated St. Edward 25-6, 24-26, 25-18, 25-11 earlier in the evening. Less than a week after defeating Humphrey St. Francis to end the regular season, Newman Grove faced the Flyers again in the D1-5 Sub-District in Columbus. The Lady Jays topped the Flyers again in a 22-25, 14-25, 25-22, 25-18, 15-13 marathon. Newman Grove faced Humphrey in the D1-5 final Tuesday night. Cedar Valley opened the D1-6 tournament with a 25-21, 25-13, 25-16 win over High Plains. The Mavericks faced Heartland in the final Tuesday.